Situated in the Robertsvlei valley you will find GlenWood wine estate. The narrow road leading to the tasting venue winds over a narrow bridge and through the vineyards and you are surrounded by the amazing mountain, best seen during the day. We made our way at twilight, with snow still on the mountain tops, to the opening of Okamai, the Japanese restaurant attached to the wine tasting venue. 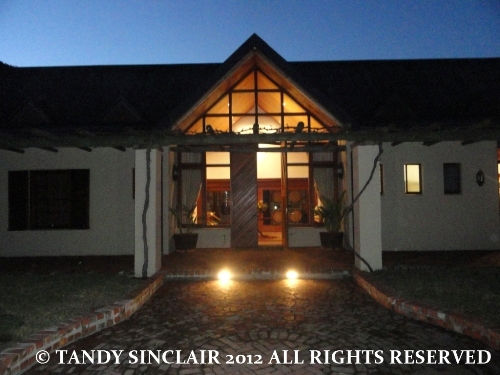 We were welcomed by the staff and we were soon joined by Alistair the owner of GlenWood and Nikki. DP Burger, the winemaker joined us soon after that and not long afterwards, the Cape Town contingent for the opening night arrived. We were sat in the intimate dining area, that will seat 16 diners at a time. The fireplace was going, and the open kitchen adds to the feeling of being a part of the food being created. Proceedings got under way with Nikki telling us why she felt this was the best way forward for the estate and then Kiyomasu Deon Sensei (the chef) told us about the food and the philosophy behind it. He is quite the story teller and there were many very interesting bits of information passed along to us, the diners. I am not sure how old Sensei is, and this is information he chooses not to share. He does however share the fact that he spent 15 years in Japan studying, and a further 10 years in New York operating his own dojo. 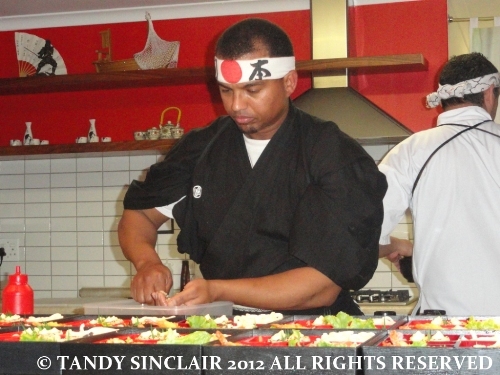 Upon his return to South Africa in 2006 Sensei got involved with NGO’s before moving on to his obvious passion for food. DP has been a part of the GlenWood estate since planting the first vines. Originally the grapes were sold to other estates, and this still holds for the Morena Brut Rosé we had upon our arrival. DP is a hands on winemaker and has his entire family involved in the process. He proceeded to tell us which wines he thought would pair well with each part of our meal. The aim here is to enhance the umami concept behind the food by finding that same quality in the wine. Before we received any food we were given an oshibori (washcloth) for our hands. Japanese tradition teaches us to give back something in the way in which it was received, to respect and honour everything, from the food we eat to the clothes we wear. Before partaking of a meal, the phrase itadakimasu is said, meaning “I humbly receive”. This is said to express gratitude for all who played a role in preparing, cultivating, farming or hunting the food. This also acknowledges that living organisms have given their life to human beings as food. Our meal started with a traditional serving of kansai miso shiru and was followed by a bento box (lunch box) full of amazing morsels of food. Sensei taught us how to hold the miso soup bowl, and that slurping was a sign of respect. 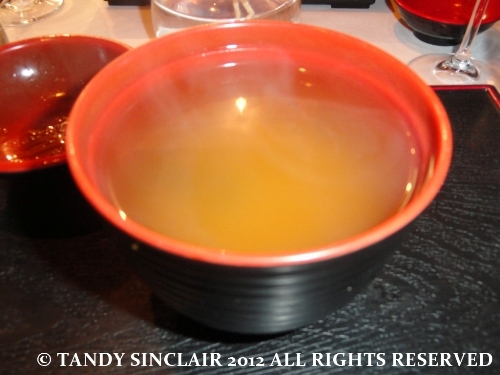 The wine recommended for the soup was the sauvignon blanc 2011. The soup was so flavourful and warming and I could easily add it to my home menu. The bento boxes consisted of sashimi, salmon uramaki, edo unadon (eel), udon noodles, ebi tempura (prawns) and chiba shumai (chicken dumplings). We were given an option for wine pairing for each part of the bento box and I ended up with asking for each wine to see if my taste buds agreed with DP’s. To my palate, and Dave agreed with me, the chardonnay vigneron 2011 was by far the best wine for the meal. 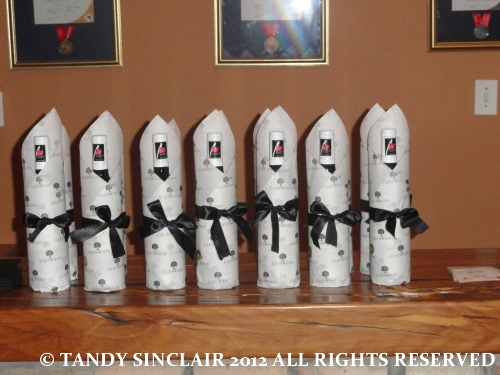 If you are a red wine drinker then you will not go wrong with either the shiraz 2009 or the merlot 2009. 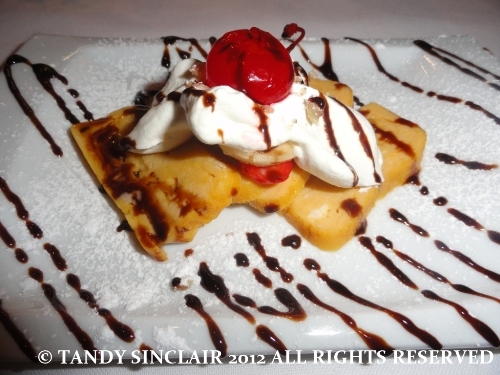 The meal ended with shibuya Japanese crepe and the banana was really emphasized by the wine I chose for dessert, which was the semillon vigneron selection 2010. 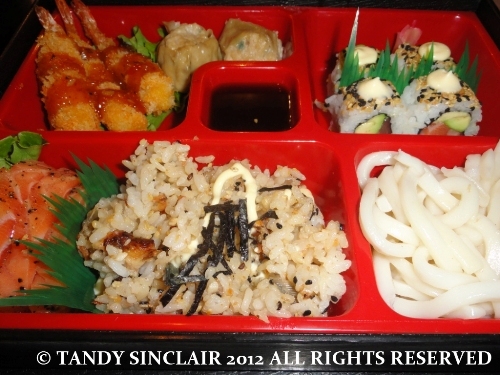 The ingredients are sourced mainly from Japan for their authenticity and the food is made with love and passion. The restaurant will trade Tuesday to Sunday from 12pm to 9pm. Contact them on 021 876 2044. Disclosure: Dave and I were invited to the opening. The invitation was not issued with the expectation of a blog post. We were given 2 bottles of wine as a thank you gift. This post is in line with my blogging policy. Excellent review, very well done! thanks Tok, are my pics showing yet? All of it looks SUPERB! Salmon AND Eel in one go? YUMMY!!! What a fun evening and I was so excited when I saw that it was Franschhoek as I spent a fabulous afternoon and evening there! 😀 What a beautiful town it is! Everything looks great, even the rolled up hand towels. Culturally speaking and cuisine wise, there is something so wonderful about gorgeous Japanese!